Do you have hard to shop for people on your Christmas list? Now’s the time to feel your loved ones out for gift ideas and catch some great deals in the process. 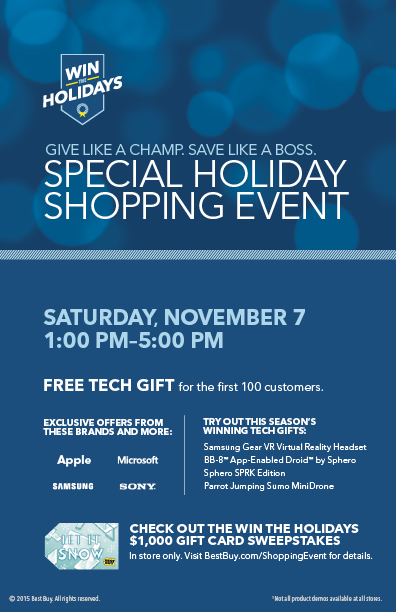 Best Buy is hosting an event this Saturday, November 7th, for the Special Holiday Shopping Event! What can you expect at the Special Holiday Event? Free Gifts! The first 100 customers, at each store, will receive a free tech gift. Preview & shop the holiday collection from the biggest brands including Apple, Microsoft, Samsung and Sony. Exclusive offers from these brands and more! This is a great way to see and compare all of the latest tech gifts for this holiday season. Experts on hand! With so many tech choices, decisions can be hard. Let the experts help you answer questions and help you find the perfect holiday gift. Play with the latest gadgets! Many of the top holiday gadget picks will be available to try out first hand. Bring your loved ones in and see what catches their eye. Visit the Best Buy website for participating store locations, more great offers, demonstrations and more!